These protected areas encompass 20,379 hectares around Thinahtea Lake and sections of the creek both north and south of the lake. Thinahtea contains riparian habitats, wetlands and upland forests with important habitat for moose and waterfowl, including Trumpeter swans. 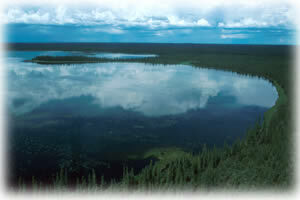 Thinahtea Protected Area is located in the north east corner of the province near the confluence of Thinahtea Creek and the Petitot River, 170 km northeast of Fort Nelson. There are no designated roads near to the protected area. Cultural Heritage: Thinahtea Protected Area overlaps with traditional use areas of the Slavey, Cree and Beaver cultures of the Dene Tha and Fort Nelson First Nations. Thinahtea means where the giants laid down. Conservation: The protected area represents features of the Petitot Plain Ecosection in the Boreal white and black spruce biogeoclimatic zone. There are significant jackpine stands mixed amongst the muskeg. Wildlife: The area contains important habitat for caribou, moose wolf, black bear and several other mammals and waterfowl; endangered, threatened and vulnerable species include trumpeter swans and water hemlock (Cicuta virosa) which has been collected at the Petitot River. The Petitot River and Thinahtea Lake contain several fish species such as Northern pike, walleye, burbot, longnose sucker, troutperch, longnose dace, and slimy sculpin. Approved Purpose Statement and Zoning Plan [PDF 1.49MB] is available online in pdf format. There are opportunities for canoeing or kayaking in this protected area. The protected area is open to hunting. All hunters to the area should refer to the current BC Hunting Regulation synopsis. There are wildlife viewing opportunities for moose, grizzly bear, black bear, caribou and wolves. Keep fires small in the back country. Campfires are permitted, however, no campfire pits are provided at this time.